One of the masterpieces of English fiction, Daniel Deronda tells the intertwined stories of two characters as they each come to discover the truth of their natures. Gwendolen Harleth is the beautiful, high-spirited daughter of an impoverished upper-class family. In order to restore their fortunes, she unwittingly traps herself in an oppressive marriage. Humbled, she turns for solace and guidance to Daniel Deronda, the high-minded adopted son of an aristocratic Englishman. But when Deronda, who is searching for his path in life, rescues a poor Jewish girl from drowning, he discovers a world of Jewish experience previously unknown to him, and to the Victorian novel. Dismayed by the anti-Semitism around him, the tragedy of the lovely Gwendolen begins to fade for Deronda. When he finally uncovers the long-hidden secret of his own parentage, he must confront his true identity and destiny. A wonderful reading by Nadia May of George Eliot's complex novel. For me, this was a far more absorbing and emotionally resonant tale than "Middlemarch"; Eliot's ability to portray the London Jewish community sympathetically seems unique among Victorian authors, at least the ones I've read. That portrayal is not just sympathetic but (at times) immersive: this is no cursory glance but a deep exploration. I can't quite give it five stars though, for two reasons: one is that Eliot's writing tends to be humorless, even though her characters are brilliantly drawn; and May, even though she gives wonderful voice to those characters, can't make up her mind how to pronounce the name "Mordecai." If you liked "Middlemarch," this one is certainly worth listening to. If you didn't, the greater dramatic intensity in this novel may still be worth a try. 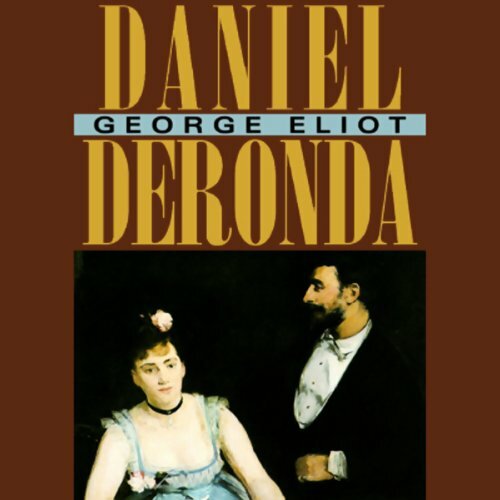 After reading/listening to Middlemarch and Adam Bede, I embarked on the 4 volume Deronda. I was happy that I enlisted Nadia May whose spectacular voice rendition of charcters pulled me through all 4 volumes. I enjoyed it all and was particularly captivated by the ugly experience of British prejudice so prevalent in cultured British society. The love story as with all George Eliot's books was tender and romantic. I had long heard of Daniel Deronda and kind of given up hope of ever reading it. But a two-hour commute each way to work made this a wonderful companion. Deep, compelling, and filled with fascinating characters, the novel is a melodrama with philosophical and religious depths. Called a "controversial novel," because of the author's ability to show the Jewish community of the 19th century in a tolerant and non-stereotypical way (in a culture, or, perhaps, a world in which stereotypes did---and do---abound), Eliot shows what is unique, human, and sometimes ignorant and insensitive in individuals, no matter their culture or religion. Nadia May's wondrous narration is truly a joy. She captures the core of each character, and her Italian, French, and German seems on the mark (although her pronunciation of Mordechai is not). She has renewed my interest in Eliot and I will surely continue to purchase books that she has narrated. A tale of triumph and tragedy skillfully told in the style of bygone years. If you enjoy classics, you'll want to listen. A bit long winded in several areas. Deronda appeals to the reader. I would recommend this audiobook to any friend who had a philosophical mind, who delights in interior, rather than exterior events, who can appreciate the mind of a truly masterful writer. Nadia May's reading of this book and its wonderfully complicated characters is one of the best I've ever heard. It's very difficult to pick a favorite character, but I would have to choose Daniel Deronda himself. He is subtle, complex, and deeply compassionate. A spiritual guide to Gwendolyn, he serves as a spiritual guide to all readers, as well. What does Nadia May bring to the story that you wouldn’t experience if you just read the book? Nadia May brought a vivid nearness to each of the characters she portrayed with such cohesion and understanding. She is more an actress than mere reader. I felt as if I were watching a play or a movie, rather than listening to a book, and this was entirely because of May's superb performance. It's almost too exquisite a reading to be called a performance. No. I listened to it over a period of almost two months. It is more than 30 hours long. What did you love best about Daniel Deronda? As with all of George Eliot's books, the language is astounding and the insights into human nature are deep. The story is interesting and morally important. What was one of the most memorable moments of Daniel Deronda? The conversations and feelings shared between Daniel and Ezra. Have you listened to any of Nadia May’s other performances before? How does this one compare? no, I haven't listened to her other readings. When Daniel met his mother. I first read Middlemarch- an amazingly brilliant book, and was so taken with Eliot that I then chose Daniel Deronda. DD didn't really grab me, seriously grab me, until chapter 32. From 32 to the end, I was completely moved. If you haven't read Eliot, or you did long ago, do give Middlemarch a go; as great as literature can get. I'm now listening to Mill on the Floss by Eliot. I'm a fan of George Eliot, but If you're wanting to get a start with her, I wouldn't recommend this one as the first to try. There are two stories entwined, one about spoiled, self-centred and self-indulgent Gwendolen Harleth, and the other about Daniel Deronda, brought up as the "nephew" of a baronet but ignorant of his true parentage. A large theme is Judaism, and I was hoping and expecting to find an examination of the attitudes of various upper-class and aristocratic Victorians to Jews. It's just not there, and I was disappointed. I was also a little disappointed with the narration: it's good, but it's not as good as the very best. There is still plenty to like about Daniel Deronda. The portrait of Gwendolen Harleth in the first half of the book, before her marriage, is excellent, and the description of how she accepts the proposal of the rich but cruel selfish Grandcourt is outstanding. An almost perfect novel, divided by two distinct plots. The first a complex and glowing account of Gwendolen Harleth, a young strongly willed girl with many charms and faults, and Daniel Deronda, a parent-less gentleman, an intellectual with empathy only for the obviously miserable, the other. Her journey fascinates me and his informs me of the world situation, at the time, of nation building. Unlike, perhaps, all other popular Victorian novels, we have a very positive portrayal of a Christian's view of Zionism. Very interesting and important, but for me jarring and awkward into what is a great story that naturally flows from Elliot. It's always a pleasure to read Eliot. This book contains the same insightful character development that makes her other books great -- characters so true you almost have to laugh aloud. But Eliot's political agenda in this book gets in the way, ultimately twisting the characters out of true, not to mention requiring the inclusion of many long and tedious passages tangential to the story. Great story wonderfully read and I simply loved it!. A great listen, enjoy and share with others! I was surprised to find, when I checked, that this book had only been rated with two stars, as I actually found it very rewarding. There were some difficult bits in it (theories concerning Jewish ideas in the 19 century etc) which I'm afraid did tend to go in one ear and out the other, but the theme of the book in general was, I thought, very powerful. Despite the fact that it was written about 130 years ago, some of the characters experienced thoughts and emotions which wouldn't have been out of place in a modern novel, and although obviously the story can't help being dated, it is no less absorbing for that. I would have struggled to get through a novel of this size in book form, and I am glad to have had the opportunity to discover it this way instead - any effort I had to make was definitely rewarded. My only real quibble is that the reader seemed to have trouble in being consistent with her pronunciation of the name 'Mordecai', which she kept varying rather irritatingly, sometimes even in the same phrase. However, other than that I thought she read it with expression and I found it a reasonable quality. Would you listen to Daniel Deronda again? Why? Because it is a great story, good escapism and satisfying to listen to. What other book might you compare Daniel Deronda to, and why? What about Nadia May’s performance did you like? Hurray for unaffected narrators such as Nadia May, who reads at a sensible pace, instead of dragging it out and detracting from the understanding by silly voices. She does justice to the wonderful writing. Haven't finished it yet, but I'm sure there will be, good novels usually have experiential realism that draws me in. This was a wonderful, thought-provoking novel. Well read and paced. Made my summer a delight! The book is brilliant. Let's leave George Eliot out of this. The reader was very good. There are lots of characters and lots of different accents. She did a remarkable job. But she had two ways of pronouncing Mordechai, neither correct, which she she seemed to have randomly chosen between over and over again. Even if there are only 200,000 Jews in Britain, she might have found one and asked how to pronounce it. I know it is petty but it took me out of the story each time it happened.